10. 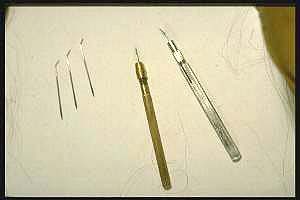 When making a wig we use a ventilating needle. 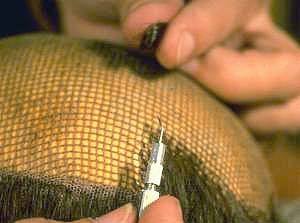 The size of the needle is determined by how many hairs ou want in a knot. 11. 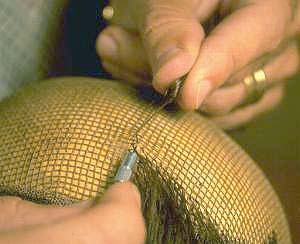 The ventilating is always started in the neck area. 12. The knot kan be compared to a rug knot. 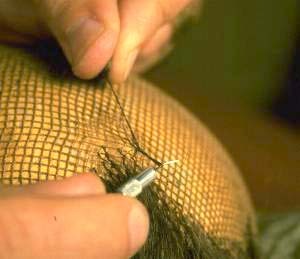 The hair is folded in the root end so it makes a loop. 13. 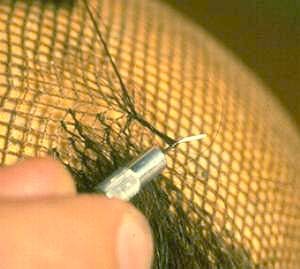 The needle is taken through the lace and grabs a few straws of hair that are pulled back through the lace. 14. 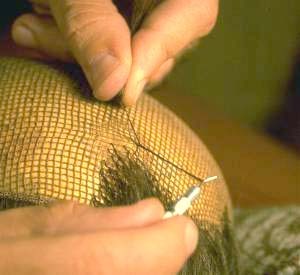 You always work with both hands at the same time to keep the hair tense. 15. You can make a simple know or a double knot. On the picture you can see a double knot that has been done twice. 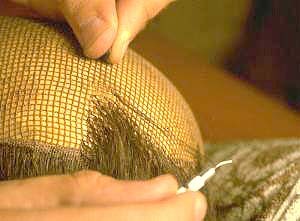 You do this on a thicker lace that is a little bit more elastic, called a filet lace. 16. It's very important to close the knot. You do this by always keeping the hair stretched between your fingers. 17. The whole hair is pulled through the loop until the knot is complete. 18. 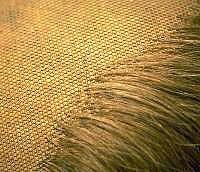 For a toupee you use a finer cotton lace or monofilament. 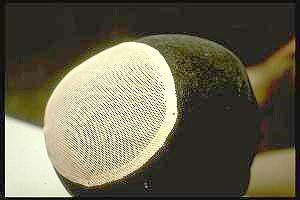 The picture shows a cotton lace with nylon ribbons to help it to keep it's shape even after it's gotten wet. All text and pictures on these 3 pages is copyrighted by Göteborgs Perukmakeri and is published with their kind permission.